“The only good thing I've ever noticed about money, the only positive aspect of an otherwise pretty vulgar commodity, is that you can use it to buy things.” Hugh best known for playing the lead character on the recent hit U.S. drama, ‘House’. 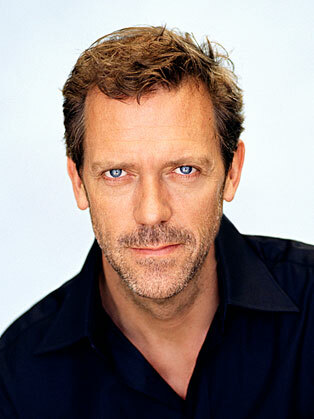 Hugh shot to fame recently for playing the much loved character of Dr. House, the arrogant yet brilliant diagnostician. Hugh has appeared in numerous roles, being a prominent figure in the Blackadder series with Rowan Atkinson, and appearing with Stephen Fry in the hugely popular ‘A Bit of Fry and Laurie’ as well as ‘Jeeves and Wooster’. In his acting career, Hugh has received multiple awards, including two Golden Globes for his role in House, and five time winner of the Peoples Choice Award for favourite TV and Male actor. Since the end of the series ‘House’, Hugh has become an internationally critically acclaimed musician, producing two bestselling albums. James Hugh Calum Laurie was born on June 11, 1959, in Oxford, England. Laurie's father, William "Ran" Laurie, was a medical doctor and Olympic gold medalist in rowing. His mother, Patricia Laurie, was a writer whose occasional essays were published by The London Times. The youngest of the family, Laurie has two older sisters and an older brother. At Eton, Laurie excelled at rowing, winning the national junior coxed pairs title and representing Britain at the 1977 Junior World Championships. He went to university at Selwyn College, Cambridge, in 1978, to study anthropology and archaeology but a bout of glandular fever prevented him from making the Cambridge crew for the annual rowing race against Oxford University. The break from rowing due to illness led him to join the Cambridge Footlights, a theatre group that has launched many successful comedy careers. It was there that he met fellow future-star Emma Thompson, and the two dated for a while. Through Thompson, Laurie met Stephen Fry, a young playwright whose comedy 'Latin!' had greatly impressed Laurie. The two became friends and would become partners in comedy for much of their early careers. In 1980, Laurie achieved his goal of rowing for Cambridge, only narrowly losing to Oxford in a hard-fought race. The same year, with Laurie as president of Footlights and Thompson as vice-president, the company went to the Edinburgh Fringe Festival and won the prestigious Perrier Award for their revue show 'Cellar Tapes'. The hit show was taken to the West End and then was filmed for television. On the strength of 'Cellar Tapes', which was largely written by Laurie and Fry, the pair, Thompson, and several others including Robbie Coltrane and Ben Elton were hired to write and perform a sketch show for television. Laurie would later tell an interviewer he became an actor when “a man with a Bentley and a long cigar turned up from London and said ‘Do you want to do this (acting) for a living?’’. The show, 'Alfresco', debuted in 1983. 'Alfresco' was followed by a string of TV comedies in the mid-1980s, with Laurie gaining either writing or acting credits, or both, and steadily building a reputation as one of Britain’s brightest funny men. In 1984, he appeared in the cult TV comedy 'The Young Ones' and two years later, debuted in the show in which he would become a major character. 'Blackadder', the brainchild of Rowan Atkinson and Richard Curtis, was in its second series when Laurie appeared in two episodes in 1986. The following year he appeared in 'Blackadder the Third' for the entire season. Playing on his posh accent and foppish good looks, Laurie’s portrayal of the simpering idiot George, the Prince Regent, to Atkinson’s conniving and bitter butler Blackadder caught the public’s attention and typecast him as an upper-class twit for years to come. 1987 also saw Laurie team up with his old university collaborator Stephen Fry. The two launched their sketch show 'A Bit of Fry and Laurie', which showcased their intelligent, dry and off-beat humour. The show ran for eight years and made the pair household names in Britain. In 1989, Laurie married Jo Green, a theatre administrator. That year, he also returned to another full season of Blackadder with 'Blackadder Goes Forth'. This time with the team in the trenches of World War One, Laurie reprised his bumbling aristocratic role as the ever optimistic Lieutenant The Honourable George Colthurst St. Bartleigh MC, a Cambridge student who had interrupted his studies to join the war. The following year saw Laurie and Stephen Fry in the series 'Jeeves and Wooster', a comedy adapted from P.G. Wodehouse’s Jeeves stories about a convivial but brainless young gentleman (Laurie, of course) who is helped out of various tricky situations by his ingenious butler Jeeves (Fry). The show ran for four series until 1993. The mid-1990s saw Laurie branch out into films, music and writing. He moved away from his bumbling fool roles, appearing in Ang Lee’s adaptation of 'Sense and Sensibility' alongside Emma Thompson in 1995, and voiced a number of characters in children’s films like 'The Snow Queen’s Revenge' and 'The Ugly Duckling'. In 1996, he played a clumsy villain in '101 Dalmatians' in addition to publishing his first novel, 'The Paper Soldier', a thriller. In 1997, Laurie appeared in the films 'The Borrowers' and the Spice Girls vehicle, 'Spice World', with a small role in the Leonardo DiCaprio blockbuster 'The Man in the Iron Mask' the following year. The children’s film 'Stuart Little' was a hit in 1999 and he returned in its 2002 sequel 'Stuart Little: The Animated Series'. Laurie returned to the small screen in 2003 directing and acting in the comedy-drama 'Fortysomething'. In 2004, he scored the role that would make him famous in the United States. Ditching his aristocratic British accent, Laurie adopted an American drawl and landed the role of Dr Gregory House in the medical drama 'House'. His limping, pain-killer addicted, cynical genius of a physician earned him Golden Globe awards in 2006 and 2007. In 2007, Laurie was also made an Officer of the British Empire. Although the series kept him busy, he still had time to work on film projects such as 'Flight of the Phoenix', which was released in 2004, followed by 2005 computer-animated film 'Valiant' and 'Stuart Little 3: Call of the Wild'. He also made a number of appearances on 'Saturday Night Live' in 2006 and 2008, as well as starring in action-crime film 'Street Kings' alongside Keanu Reeves, Forest Whitaker and Chris Evans. The animation 'Monsters vs. Aliens' (2009) saw Laurie provide the voice of Dr Cockroach, PhD, a role that was followed by a portrayal of himself as House in the animated television series 'Family Guy' in 2010. He went on to have another voice part in an episode of 'The Simpsons' in the same year and was also cast for leading parts in 'Arthur Christmas' (2011), a 3-D computer animated film, and romantic comedy 'The Oranges'. Laurie divides his time between London and West Hollywood where he films 'House'. He and Jo have three children, a daughter, Rebecca, and two sons, Bill and Charlie. Laurie’s life-long friend Stephen Fry is godfather to his children. Laurie, a massive fan of blues icon Muddy Waters, describes himself as a “frustrated musician’’. He can play piano, guitar, drums, harmonica and saxophone and once told a radio interviewer his fantasy was to play in a jazz trio in out of the way hotels. Having missed the rock-star boat, Laurie consoles himself playing music with his children and in a band called Poor White Trash and The Little Big Horns with fellow performer Lenny Henry. Though Laurie has led a successful and rather charmed life, he admits to struggling with depression for which he receives counselling. Laurie once told an interviewer he realised he had a problem when he found himself bored in a celebrity demolition derby. His dry, self-deprecating wit turned even this into a humorous line: “Boredom is not an appropriate response to exploding cars,” he said.